Before your wedding, you will be able to see and handle example wedding albums showing brides and grooms looking gorgeous. The quality of the leather and printed pages just enhances your special memories. 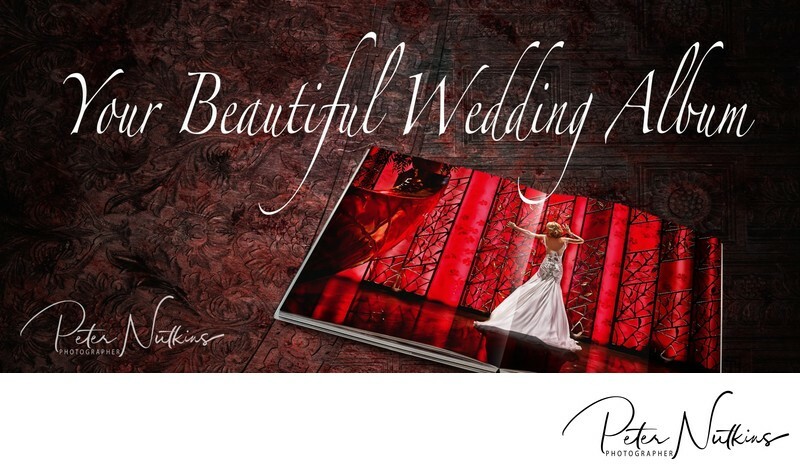 Your beautifully crafted Italian Album will contain your photographs printed directly onto luxurious thick pages. Every page spread is bound together in a special block that opens flat. This enables you to view your album seamlessly across two pages. The size of the album makes a big impact. Each spread measures 80cm by 30cm. It is a thing of beauty. A wedding album showing the thickness of the pages and the open flat block. Not only will you want to just look through it again and again, but every visitor to your home will also want to share in the emotions and memories of your day. Think of the future also. Imagine your grandchildren coming across a bespoke wedding album. As they touch the Italian leather and gold inlay of your names they know exactly what they hold in their hands.